This post has been long overdue. 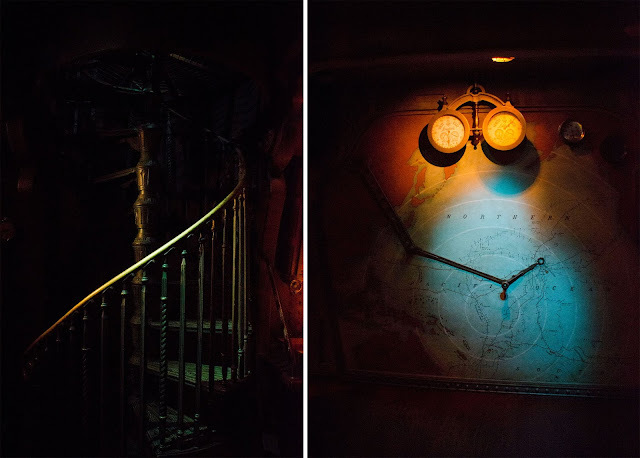 As you all know, I'm a big 20,000 Leagues fan and if there is a Nautilus still left at a Disney park somewhere in the world...I need to see it! Here we have another 20,000 Leagues outfit (of course) but this time, I'm dressing up as Kirk Douglas who played Ned Land in the original movie. 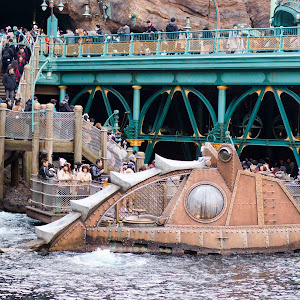 This outfit was so much more comfortable than my Captain Nemo outfit from Tokyo DisneySea! I had forgotten that their Space Mountain is actually the Star Wars influenced Hyperspace Mountain, as you can see from the large poster above. Thankfully it didn't take away from the aesthetic or the design of the area. 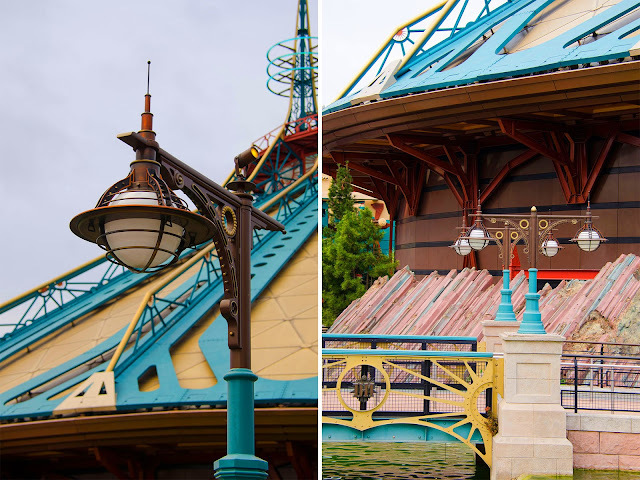 The teal, golds & browns looked so well together here, & I love how the entire land is very steampunk & industrial, yet also very futuristic! 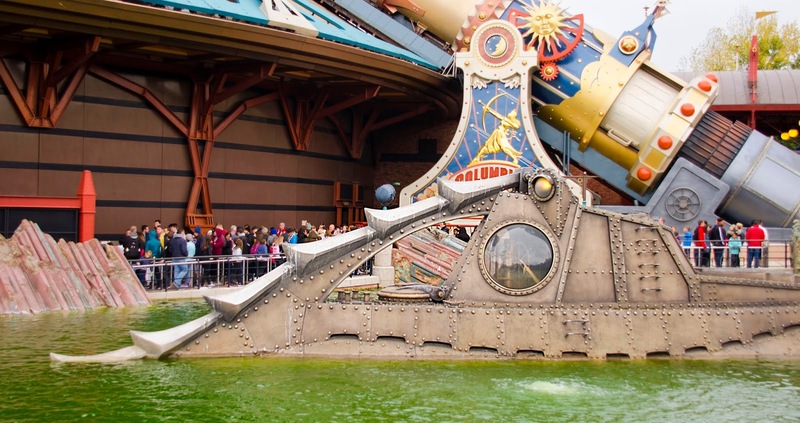 Below is the Cafe Hyperion quick service restaurant, & next door is Videopolis, a large stadium seated movie room, which (while I was there) played Mickey cartoons. It was a nice place to sit & relax, especially if it is raining or too cold outside. 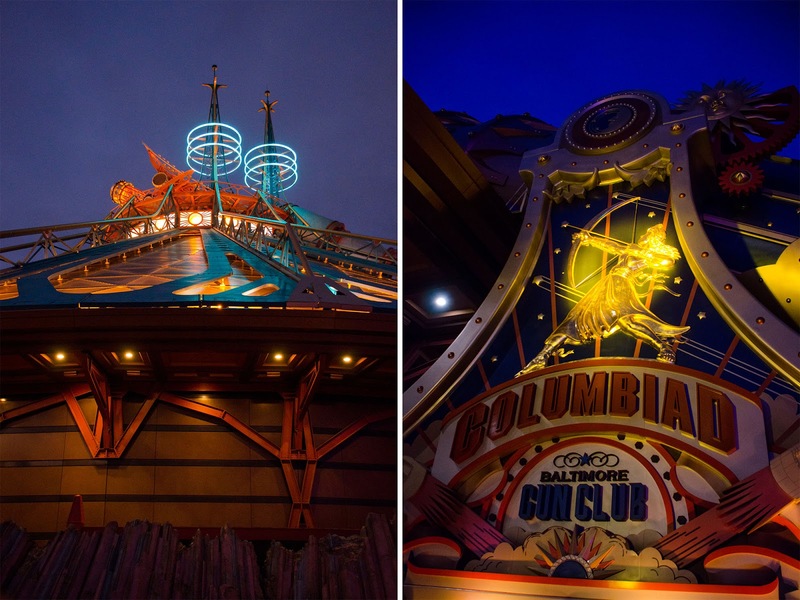 Sadly, I didn't get to go on Autopia, but its colors & neon lights were so pretty! 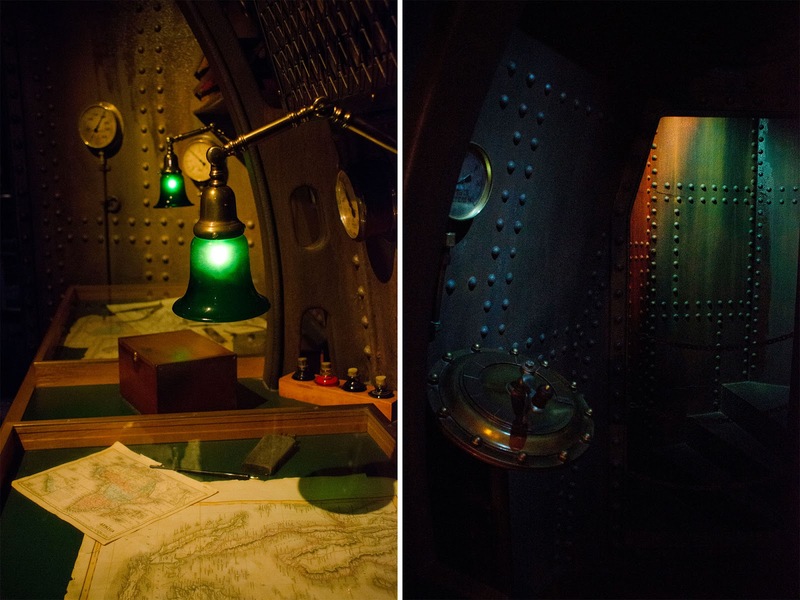 Below is the entrance to the 20,000 Leagues exhibit, and it is to the right of the actual Nautilus. 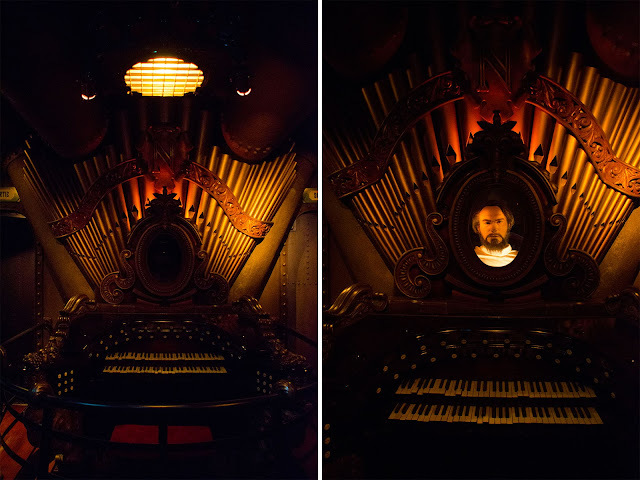 This place was an absolute dream, and is filled with so many details from the movie, including a map of Vulcania (a little nod to Tokyo DisneySea), the diving chamber, and Captain Nemo's organ. To say I geeked out walking through this would be a huge understatement. If you check out my archived instagram stories, you will see a few of this exhibit! The infamous squid comes & goes from this large porthole every few minutes, so make sure to stop & watch him. Also, Captain Nemo's face appears & disappears in his organ near the squid porthole. And now, for some pretty night shots. I would also like to mention that almost EVERY ride in Disneyland Paris was better than any other ride in WDW, Disneyland, or Tokyo Disney! Space Mountain was unlike any other, going upside down & launching at the beginning like the Rock 'n' Roller Coaster! 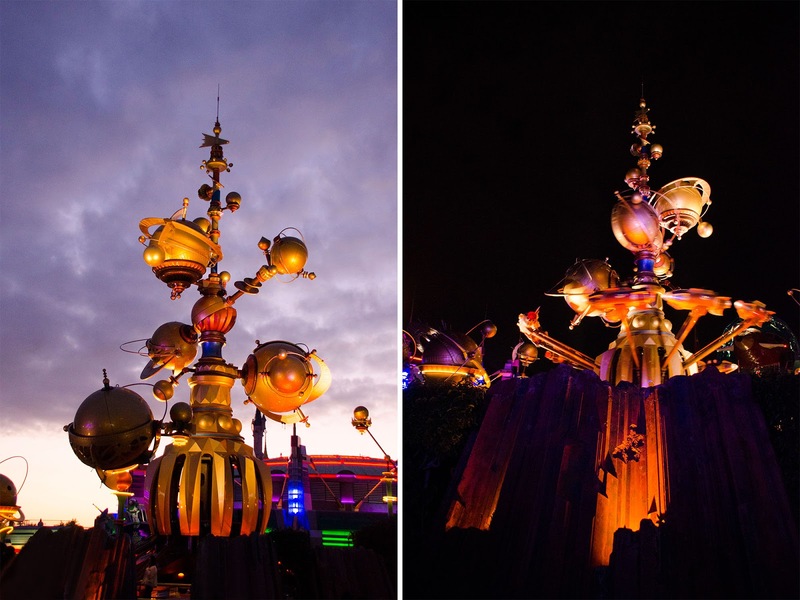 It was really neat how their Orbitron looks super similar to Disneyland's Astro Orbiter! Here's me & my Dad from the Space Mountain ride photo, and also some colorful trash can & poster graphics. I also, sadly, didn't get to ride Star Tours either, & I'm not sure why I took this random side view picture? I think we were on our way out of the entire park when I took this, so it was probably freezing & we were for sure exhausted! 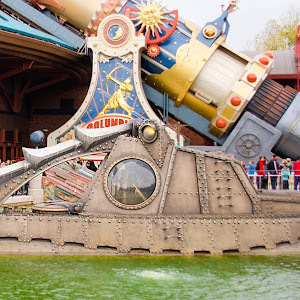 I hope you enjoyed this little collection of photos from Discoveryland at Disneyland Paris. 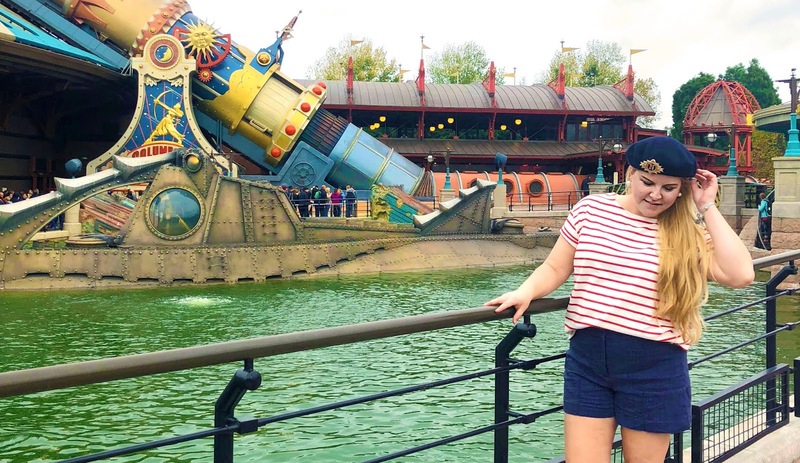 I love this land so much, and if you are a nostalgic Disney fan like me, I truly hope you get to experience this, because it is beyond magical! A vintage girl, living in a 21st century world. My name is Melissa & welcome to my blog! I'm obsessed with nostalgia & anything vintage, I love to travel, and I'm always planning my next trip to Walt Disney World. 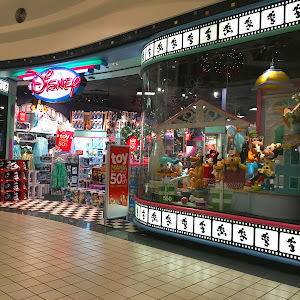 This is where I share my love for Disney, travel, crafting, fashion, & my latest estate sale treasures. I hope this blog finds you smiling, dreaming, & inspired. All photos on this blog are taken by me, unless stated otherwise. If you use one of my images on your non-commerical website or blog, please give proper credit and link back to this blog. Please do not use multiple images from one post...I work really hard to take and process these images, and they are the creative property of In Cindy's Shoes. Thank you! © In Cindy's Shoes. Design by FCD.